Riverdale, Insatiable and 13 Reasons Why Tackle Tough Issues. They Miss the Mark. ‘Riverdale’, ‘Insatiable’ and ‘13 Reasons Why’ have attracted hordes of viewers but continue to face backlash for their sexism, fat-shaming and suicide respectively. These Netflix UK shows deserve credit for tackling real-life issues for many teenagers, but they've failed to treat them in a sensitive, progressive manner. The third season of ‘Riverdale’, which premiered in the UK this week, continues the series’ obsessive use of objectifying, slow-motion shots of scantily-clad female characters. The show's protagonists - Archie, Jughead, Betty and Veronica - are more fully realised than they were in Archie Comics, but they fall victim to regressive gender representations. Last season, Jughead was beaten by every member of the Southside Serpents in order to join their gang – an exercise in toxic masculinity – while Betty had to perform a pole dance. Betty’s initiation is framed as a liberation of her suppressed sexuality, but the whole concept feels voyeuristic and misogynistic. The writers might argue these policies are befitting of a violent, leather-clad gang, but they send a damaging message to an impressionable audience. Similarly, ‘Insatiable’ has encountered pushback over its ‘revenge body’ narrative, which many critics deride as fatphobic. A petition calling for the show’s cancellation has amassed north of 23,000 signatures. The show’s writers and stars argue they’re satirising our looks-obsessed culture and showing that 'thin' doesn't equal 'happy', but that message is easily missed. The misogynistic portrayal of women undermines those claims too: women are sexualised and fetishised throughout, and there’s an almost Hitchcockian obsession with the main star's mouth. Indeed, the women of ‘Insatiable’ almost universally rely on their sexuality to succeed, and the beauty pageant theme doesn't help matters. ’13 Reasons Why’ may be the starkest example of an irresponsible teen show. Its first season - which follows the story of a teenage girl who commits suicide and the fallout for those around her - was roundly denounced for its graphic, romanticised and overly rationalised portrayal of self-harm. After parents and mental-health specialists voiced concerns, and psychologists advised depressed teenagers to avoid the show entirely, Netflix added trigger warnings before each episode as well as a video of cast members telling troubled viewers to seek help. All three shows make admirable efforts to address issues that affect many teenagers, but they can do a better job. 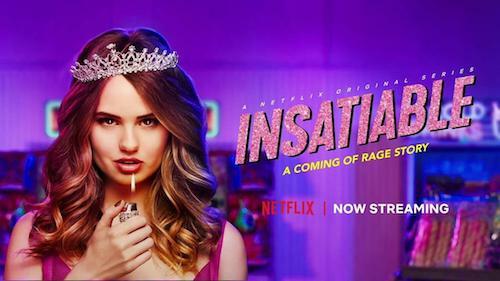 ‘Insatiable’ could have focused more on body positivity than fatphobia, as shows such as ‘My Mad Fat Diary’ and ‘Dietland’ have done. It could also disentangle mental health issues from physical ones. ’13 Reasons Why’ can learn from ‘This is Us’ and ‘Girls’, shows that were praised for their informed, thoughtful representations of mental health issues such as anxiety disorder and obsessive-compulsive disorder (OCD). And ‘Riverdale’ might emulate ‘Brooklyn Nine Nine’, which endows its female characters with other traits than being women, and competently walks the line between sexual repression and sexual reliance. Screenwriters should learn from the mistakes and misconceptions of their peers, but they shouldn't shy away from telling difficult stories. It's inclusive and empowering for people struggling with health issues or trying to understand their gender and sexuality to see their challenges represented on screen. Diverse writing rooms, audience testing and consultations with experts can help creators to avoid common problems and portray characters convincingly and compassionately.